Under the auspices of the Student Activities Department, the faculty of Engineering organized a solar car race in collaboration with Infinity Team on Tuesday7/3/2017. A group of Electrical Engineering and Mechanical Engineering students participated in the race. 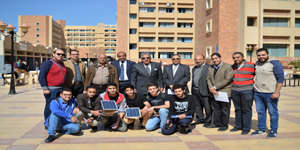 The race was held in the presence of Prof. Ramadan Abu El-Ala, the Vice President of Community Service & Environment Development Affairs, Prof. Mohamed Gaber Abou Ali, the faculty Dean, Prof. Mohamed Abd El- Rahman, the Head of the Electrical Engineering Department, some staff members and teaching assistants. The winning teams of the best solar car design and the fastest solar car were honored by the end of the day. It was also announced the upcoming phase of the competition.